WTI crude prices are ascending once again, heading toward $49.00/b this morning. WTI opened at $48.79/b today, a drop of $0.22 below yesterday’s opening price. 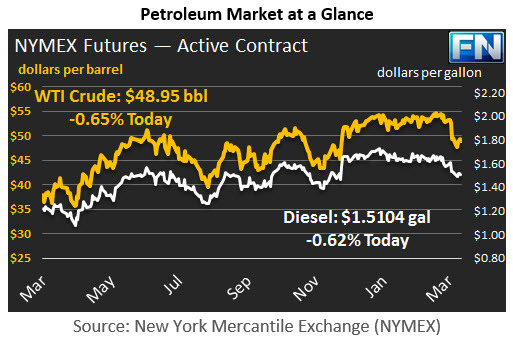 Current prices are $48.95/b, a recovery of $0.20 above yesterday’s close. The oil complex is trending back up this morning. Diesel opened at $1.5046/gallon in today’s session. This was a drop of 0.87 cents from yesterday’s opening price. Current prices are $1.5104/gallon, up 0.6 cents from yesterday’s close. Gasoline opened at $1.5919/gallon today, a small increase of 0.24 cents from yesterday’s opening. Prices are $1.601/gallon currently, a rise of 0.68 cents from yesterday’s close. This week’s EIA report on stocks showed a small crude stock draw of 0.237 mmbbls. It was the first stock draw of the calendar year, and it came as a surprise to the market, which had anticipated another build of 3 to 4 mmbbls. Gasoline stocks were drawn down 3.055 mmbbls, and diesel stocks were drawn down by 4.229 mmbbls. This halted, but did not fully reverse, the downward trend in prices. Today, however, prices are trending back up on the news that Saudi Arabian Energy Minister Khalid Al-Falih made a statement to Bloomberg that OPEC might extend the production cuts beyond the original six-month plan if global oil inventories remained above their five-year average. Earlier this week, OPEC released its production data for the month of February. OPEC reported another decline in output that builds upon the cuts already achieved in January. In total, OPEC reported that its output declined from 32,099 kbpd in January to 31,959 kbpd in February, a drop of 140 kbpd.